When Claude Shukur came to Union High School in December 2012 as a 16-year-old refugee from Rwanda, he immediately faced a huge academic challenge: the English language. 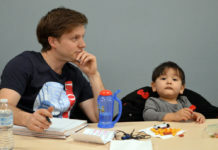 But do the work he did, learning English and other essential skills in Union’s Newcomers program, along with other students from Africa, Afghanistan and Latin America. 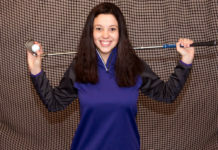 He enjoyed the challenge, transitioned into the regular curriculum and graduated last spring. Today Shukur is helping other immigrant students overcome similar challenges, having been hired by Union to assist with an influx of 10 newcomers from Rwanda. He interprets for them in classes and helps them with homework. “I just want to help them to pass their classes, and to focus for what they are doing, not to focus to what their other friends are doing. To believe what you are doing,” Shukur said. In a school where more than 35 percent of the students come from non-English-speaking homes, the odds are longer for having students graduate in four years. 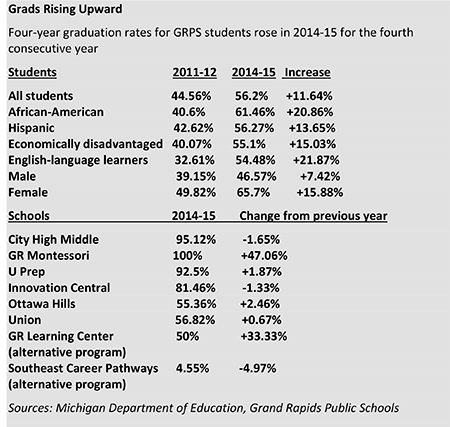 But students like Shukur are showing steady improvement in Grand Rapids Public Schools (see related story). 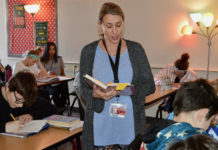 Graduation rates for GRPS English-language learners have improved by nearly 22 percent since 2011-12, recently released Michigan Department of Education figures for 2014-15 show. 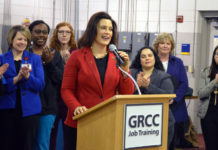 That helped boost GRPS graduation rates overall by 11.6 percent over four years — to 56.2 percent from 44.5 percent — along with even higher increases among African-American, Hispanic and low-income students. Though far from where they should be, officials say, the numbers show consistent gains since Teresa Weatherall Neal became superintendent in January 2012. Neal credited the GRPS Transformation Plan and the work of teachers, school leaders and support staff for the encouraging trend. 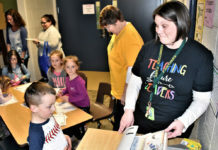 It’s important to recognize the gains while acknowledging rates are not satisfactory, said Ron Gorman, assistant superintendent of pre-K-12 instructional support. The increases raised the rate above 50 percent for the first time in several years, but it is still well below the statewide rate of 79.7 percent. Other Kent ISD districts below the state average include Godfrey-Lee (77.1 percent), Godwin Heights (69.1), Kelloggsville (62.1), Kentwood (74.8) and Wyoming (68.8). All are among the county’s lowest-incomeschools. However, those numbers can mask significant gains by lumping base high schools with alternative programs for struggling students who commonly need more time to graduate or earn a GED, Godfrey-Lee Superintendent Dave Britten wrote in his blog. Lee High School’s rate was 92.7 percent. 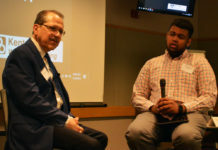 In GRPS, incarcerated students and those with cognitive impairments, who may take longer to graduate or only earn certificates, are also counted against the graduation rate, Gorman said. Excluding alternative programs and special education centers, the GRPS graduation rate was 80 percent, he noted. The district under Neal has worked to improve graduation rates in several ways. One is by better tracking students who move to other districts, but who are counted as drop-outs if GRPS has no record of where they went, Gorman said. Another is by identifying struggling students when they are freshmen, and getting them the help they need early instead of waiting until they’re juniors and seniors. That way students don’t fall so far behind that it’s too late for them to recover, Gorman said. “We’ve narrowed our focus and have gotten smarter about our interventions,” Gorman said, noting research shows students who pass four of five freshman classes are four times more likely to graduate. Combined with other elements of the Transformation Plan, such as expanded dual enrollment and better test scores, the upward trend should continue, he added. 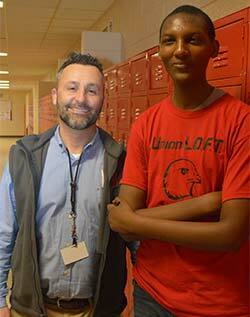 At Union High, Principal Karl Nelson sees the value of the changes. This year, a new reading intervention program for freshmen is serving about 200 students, with more waiting to get in. The student body encompasses about 16 languages, bringing “gifts and challenges from whatever their native country was,” Nelson said. Many come with no formal education or school documentation, yet are expected to graduate along with their American-educated classmates. 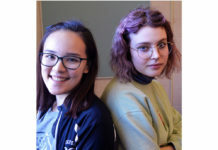 Union’s Newcomers program gives foreign students from ages 14 to 19 a year of language, math and cultural adaptation, with three teachers serving 61 students currently. Those with documented, formal education usually are placed into the regular program with some support classes. For students like Claude Shukur, Newcomers provides a firm footing on a path to graduating. Last year, 38 percent of Union grads were English-language learnerslike him. 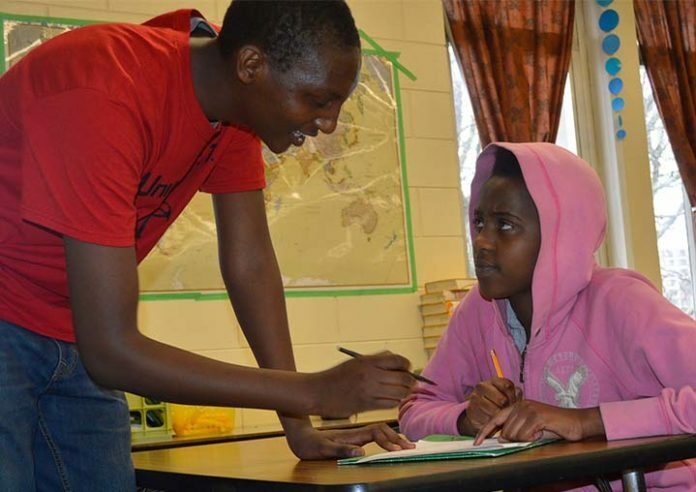 Shukur came to Grand Rapids more than three years ago after spending 16 years in a Rwandan refugee camp, where his family had fled from a horrific war in the Democratic Republic of the Congo, formerly Zaire. He received some Union credit for his schooling in Rwanda, where he read English but had never spoken it. However, he was fluent in Kinyarwanda, Swahili and French. The latter helped him at Union, where a French teacher would translate English words for him. 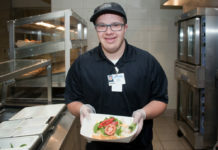 After taking classes in English as a second language and summer school, he was able to understand enough to take regular classes. Along the way he also played on the internationally flavored Union soccer team as well as baseball. 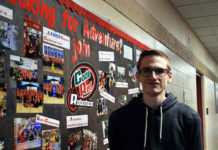 Now studying civil engineering at Grand Rapids Community College, he comes back to Union to help other students from Rwanda and elsewhere adapt to a new language and culture. He sees them struggling as he did. 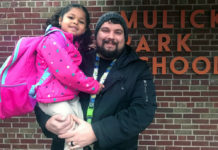 Nelson, the principal, said Shukur is an inspirational student who also volunteers at an after-school church food pantry. Through his teachers, fellow students and sports, Shukur has come to appreciate the value of making friends in his new country. “When you have a good friend, you find more good friends,” he said.